Lauren on Mick and tiny Jordyn on her Snowboy-2008. 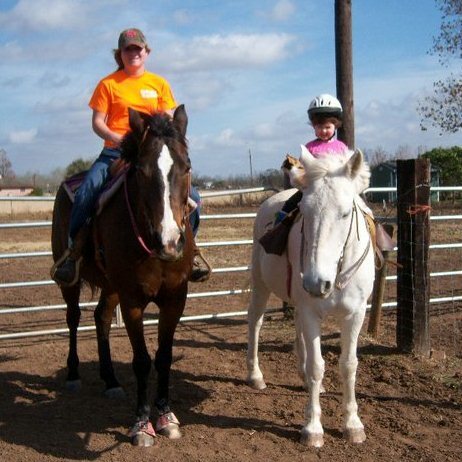 Five year-old granddaughter, Jordyn, spent a week at Miss Dianne’s horse summer camp. While there she overcame her fear of trotting (probably instilled in her by pushing her too far, too fast, on horses that were too much). See a common theme here? Jordyn, like most intelligent beings, resists fear. I know there are the adrenaline freaks out there who no matter their age, love to be scared, but most of us do not enjoy the feeling of being out of control in a situation. Jordyn has spent a lot of time at the farm but the most consistent, regular time was when she was 18 months to two years of age. Ally had just started back to work, was going to college and needed some child care help. Jordyn came a couple of days a week and spent the night for several months. There was lots of time to get on the pony. Snowboy was still here then (and he will be back one day soon) and Jordyn loved nothing better than that pony. We could saddle up Snow, throw Jordyn up and Snowboy would reliably trudge around the arena behind Mickey for as long as Jordyn wanted to ride and she never wanted to get off. She trotted then in her little saddle on her white pony. Not a lot but enough. Fall turned into winter, my workload increased, Lauren was in school and Jordyn started regular day care. Snowney went off to Uncle Dev’s (as Jo calls him), really Lauren’s trainer. He has been used as a lesson pony there for a few years now. Jordyn would sporadically come and ride but we never had the consistent days like we did before. 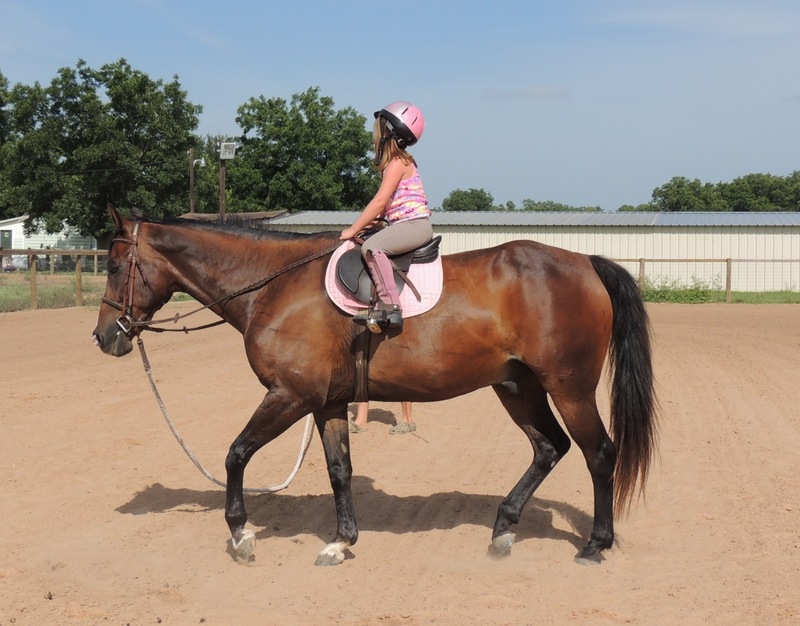 When we tried to push her on to doing something other than just walking, invariably our show horses or young ponies would not provide the stable mount that was needed. They were either completely reluctant to do anything or hyper-sensitive to being asked for more speed. Jordyn got a bumpy, scary ride. She wanted off the horse now and no more trotting-ever! We made a real attempt at regular lessons in this last year but new babies, shoulder surgery and broken arms got in the way of our best intentions. I thought horse camp might be just the catalyst that Jo needed to push her to the next step in riding but riding a small pony and getting on a big horse are two different deals (I am resisting the urge to say animals, here!). I did not know how she would do when she had to sit, trot, steer and hold the horse back simultaneously. Jordyn was anxious to come show us what she had learned at camp. She had been down to the house a few times since camp but rainy weather had kept us off the horses. Finally, the time had come to see Jordyn trot. The best I had to offer for her to ride in my barn was Mickey. The semi-retired jumper living a life of ease, he has not been worked consistently at all in the last months. Mickey can be very nice to ride. I would put beginner adults on him and expect he would behave. But Mickey can assess a situation pretty readily. Horses can read their rider. And Mickey is certainly a pro at taking advantage of any situation. A 45 pound child would be no match for him if he decide to buck, take-off or act up. How re-assuring that was! Still, Feather at six, was the next choice and I had no idea what she would do if asked to trot by a little bug on her back. Most likely she would be lazy but if she did trot, it wouldn’t be near as easy to ride as Mickey. I flat ruled out Bruno (for obvious reasons, like Jordyn might die) and Kid (he would walk great, any faster he would be difficult to control or could just seize up and take his final breath from the exertion). Pixie is still in the evil pony stage of life. Pretty reliable for me at the walk and trot but handy with a duck of her head or a quick buck. Yeah, it had to be Mickey. While Ally was at physical therapy, still re-habbing the broken arm, Jordyn, Lauren, baby Kendyll and I (shadowed by Kona and Lula) headed to the barn while the heat index still tipped over a 100 degrees. Mickey was saddled and bridled. Jordyn got on her helmet and half-chaps. It was time! Mickey walked around the ring, wanting to head back to the gate but Jo was doing pretty well keeping him on the rail at a walk. Lauren confided in me that she had ridden the tar out of Mickey earlier in the day and had been greeted with some bucks. Now, Mickey was just being stubborn. I watched Mickey, watching his ears twitch and his tail switch. I was afraid he was a kettle waiting to boil over. I did not want to see Mickey take off and dump Jordyn to the ground. I could be assured that Jordyn would be done with this whole trotting at Granny’s farm thing if she took a hard fall. Who could blame her? So, I decided to let Jo trot first on the lunge line where I could handle Mickey’s stopping and going. She could focus on learning to accept the motion of the trot, gain confidence in her seat and start learning to post. Keeping control of Mickey would be in my hands instead of hers. I clipped on the lunge line, told Jo to say ‘trot’ when she was ready and off we went. Mickey started off in his old-fashioned western jog (the perfect confidence builder). Jordyn excitedly yelled at Lauren to watch her trot. And she did, around and around, pushing her little heels down and shoulders straight. Lauren and I exchanged spots, she on the line and me with the baby. Jordyn trotted some more, absolutely delighted to be accomplishing what she had said she would do. We sweated in the hot sun, waiting for Ally to get back from PT. We didn’t want to go in before she got to see Mickey and Jo in action. Finally, about the time Mickey was past sweating and starting to foam a little from actually working, and the two black dogs were dying of heat exhaustion, Ally pulled in. Jordyn’s mom was thrilled with Jo’s riding. She quickly videoed Jo and Mickey so she could share the accomplishment with Jordyn’s dad later. I now have a trotting granddaughter! It was a big day for her and no doubt one she will be building on readily in the future. Mickey, I hope your brief retirement was sweet, because there is a new little girl who is going to want a lot of rides! Jo trotting around and around!